It was a miracle that I did not gain more than 2 lbs. during the past couple of weeks since Sicilian food was a highlight of the trip. We had simple and rustic and home-cooked food as well as fine dining. We tried street food and sampled Sicilian specialties. We noticed differences between regions. 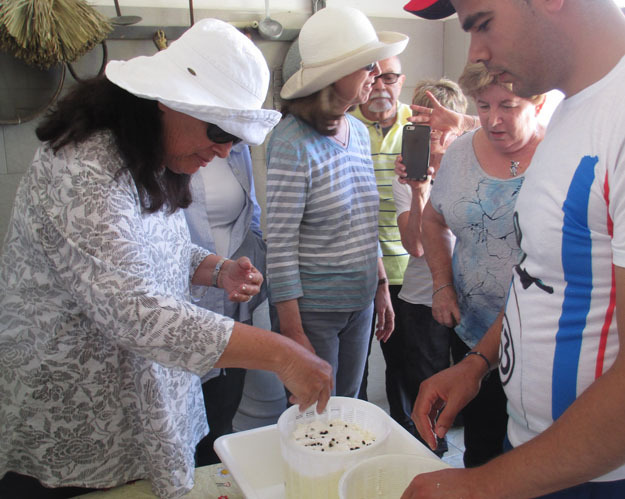 We enjoyed the luscious fruits including the juicy and sweet oranges, the salty olives, a variety of mild to pungent cheeses, mushrooms, and learned all about olive oil and how to use it. 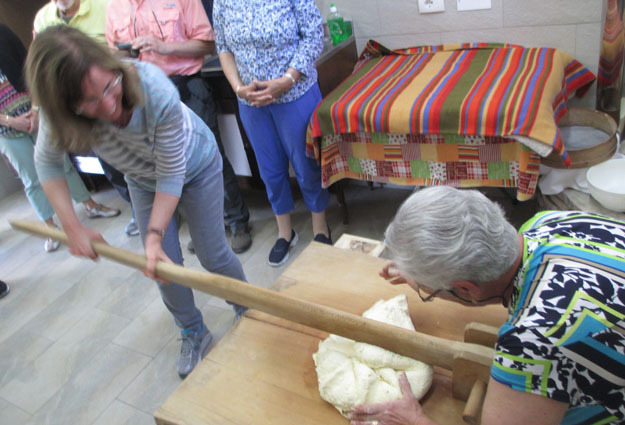 We learned that Sicilians typically have meat or fish only three times a week and prepare dishes with dried beans and cheese for protein the rest of the week. We saw prosperous agricultural regions where fruits, nuts, and olives are harvested from trees and where vegetables are grown in fields or greenhouses. We had cooking lessons and came home with recipes. And we enjoyed pizza, of course! This is Serefina’s hearty chickpea soup where we were instructed to drop pieces of bread (crusty and chewy) into it and finish off with a drizzle of olive oil. Perfecto! Charlotte and I especially liked the starters (antipasto) which consisted of cheeses, olives, cold cuts, fried rice balls, marinated vegetables, tapenades, battered and fried vegetables, savory pastries, and much more. This is a meal that we had in Palermo where we went into a fast food antipasto cafe and chose from the display what we wanted piled on top of salad greens. Yummy. Giuseppe even talked us into tasting spleen! One small taste was enough for me. Below is a meal where we threw ourselves at the mercy of the waiter who presented us with a meal of a variety of roasted veggies, a variety of cooked fish, and a variety of raw marinaded fish of his choosing. We loved it! When meat or fish was served it was often with either a salad or vegetable on the side. For dessert we had cakes, tiramisu, and cannolis, of course. Cannolis originated in Sicily and were superb. AND GELATI!! Super creamy and sticky with intense flavor. We frequently took our rest stops at cafes where we made small purchases so as to use the restrooms. On this occasion, Giuseppe treated the group to a sip of Averna Amaro, a sweet digestive liquor made with herbs and citrus rinds and caramel. This entry was posted in Sicily 2016 on May 25, 2016 by JWH. Mid May is the perfect time to travel to Sicily to experience wildflowers. From the bus windows I observed colorful fields of flowers that I was unable to capture in photos. I captured better images up close, but sacrificed the massing of the blooms. So here are a couple of landscapes I took off of the internet. The weather has been delightful. A majority of the days have been sunny, some days with intense blue skies with no clouds at all. Temperatures have tended to be in the mid 70’s to the mid 80’s during the day. A couple of days were overcast but still with light. However, on the day that we visited Mount Etna the weather was very changeable. At times it was overcast with dark clouds and at other times the sun poked through. Occasionally it rained some and it was windy, at times very windy and cold. This is how the day started out. The buildings and pavements in this area are constructed of the volcanic rock that produced Mount Etna. I saw a number of murals on the walls in the town that depicted Mount Edna and the agricultural abundance that the local people enjoy due to the rich soil in the area. Mount Etna is still active and had spewed steam and smoke from one of its four craters just a couple of days before. Rising 10,000 feet, it is the largest active volcano in Europe. Because it lets off steam on a daily basis, it is safer than volcanos that build up pressure and then erupt violently. And when lava does flow and threatens villages, it flows at only 7 mph so that there is plenty of time for evacuation. Also, the slowness provides the opportunity to divert streams of lava by dropping cement barriers from helicopters as well as blasting valleys to direct the flow away from villages. As we proceeded upward we observed places where lava and rocks had descended covering portions of the landscape while leaving patches of healthy vegetation. As we approached 6000 feet, the area was mostly barren. 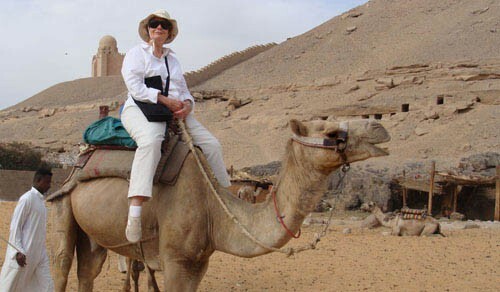 At this point we had the option of taking a ride on donkeys to visit the area or of staying back. Only three hearty souls, Charlotte included, decided to brave the elements since the weather was not nice – very windy, very cold, and misty and very moist. I stayed back and enjoyed a cappuccino instead! Obviously, we could not see the top of the volcano and glad we had had a peek at it the day before. The stables for the donkeys at one time were a ski lodge and restaurant that were destroyed by lava some years ago. On our way to lunch we visited a local cemetery where our local guide, Santino, showed us the tombs of his parents and grandparents. Family is a huge thing in Sicily and parents today are saddened when their children move away, often to other countries, because they are unable to get jobs in Sicily where unemployment is over 30%. We were jubilantly greeted by Santino’s wife, Serefina, and invited to have lunch in a building on their property that at one time was used for making wine. Serefina started the meal with soup, which we were happy to enjoy on such a raw day! Not only was Serefina a terrific cook, she was also a “hot ticket” who sang and joked with us without a word of English. It was much fun! The X in the photo is where stomping on the grapes took place when it was used as a winery. This the first of TWO cakes that Doreen received on her birthday and which she shared with us. Italian birthday cakes have multiple layers of cake and filling and are iced with whipped cream. Yum! And it was served with Prosecco. More about food in my next post. One more post to come. Taormina is known for its ancient amphitheater and its shopping. Located on a hillside on the east cost of Sicily, the Greek amphitheater was remodeled by the Romans and at one time could seat 10,000 people. It has been partially restored and is used today for concerts and productions that include an annual film festival, dance, opera, and classical and rock concerts. From this elevated spot, there are spectacular views of the Ionian Sea and Mount Etna when it is not hidden by mist and clouds. This charming city is built on a terraced hill side with narrow streets and lots of steps. The main street has shops galore. Many are the typical tourist shops carrying the same merchandise that we have seen in every town we’ve visited. Tee shirts, magnets, aprons, hats, trinkets and knickknacks, etc. There was a lot of coral jewelry and beads made out of lava rock from Mount Etna. Sicily is known for its ceramics and it was everywhere. Along with the tourist shops were upscale shops carrying Italian shoes, clothing, and jewelry. Late in the day on our way back to the hotel we saw a bit of the top of Mount Etna. It was our only opportunity because the next day when we visited the volcano, the top was hidden by clouds. This entry was posted in Sicily 2016 on May 23, 2016 by JWH. On our way to Syracuse we traveled a highway with miles and miles of broom and oleander planted in the medium strip. It was gorgeous! Syracuse is a city with a rich history dating back to the Greeks, Romans, Normans, and the 17th century Baroque period. The old city is located on a peninsula on the southeast coast of Sicily. The buildings and pavements are constructed of a light colored limestone that, even on an overcast day, gave the city a glow. Once again we walked through both wide avenues and narrow streets viewing ancient Greek ruins that were repurposed by succeeding groups of people. It is a very picturesque city. Charlotte and I explored a local market where we discovered many offerings of olives, tomatoes, veggies, fruits, meats and fish. The orange fruit is nespole, a fruit new to me. They are juice and have a sweet/tart flavor and two big seeds inside. The berries on the right are mulberries. This lady is selling fresh squeezed orange juice. On the left are sea urchins and the fellow on the right is offering fried sardines. We stopped for lunch at his place and had mussels – delish! This huge fish head was being stripped of its cheeks and forehead. Later in the day we toured the waters around the city by boat. At the end of the peninsula stands this castle, a military fortress designed by the Greek mathematician, Archimedes. While cruising the bay we encountered a low bridge. So we ducked our heads and our captain lowered the awning and we passed under. Next we visited the city of Cantania, a city that was an important city during the Renaissance as a cultural center. 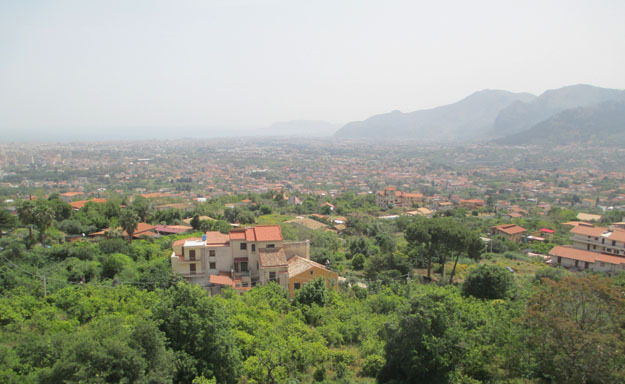 Sicily’s first university was established here in 1434. The architecture of Cantania is characterized by dark buildings with light decorations – much different than that of Syracuse. We spent a morning visiting an interesting WWII museum that explained with documents, artifacts, displays, and diagrams the Allied landing on Sicily where the Italian people were joyous to receive the Allied soldiers because they were tired of the war and no longer trusted Mussolini. The museum was located in the bombed out remains of a sulfur factory that had been cleverly repurposed. We then visited a thriving fish market where we saw an endless variety of sea creatures! Next are Taormina and Mount Etna. Stay tuned. 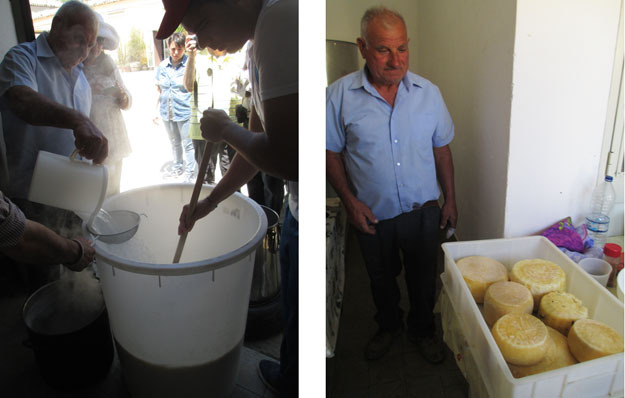 We traveled into the countryside to spend a day with Concetta and Turi who operate a small dairy farm outside of Modica. The farm has been in Turi’s family for several generations. Farming is a hard life and none of his children want to continue with it. This is a dilemma for many families. Turi’s father built the farmhouse where Concetta maintains a container garden of flowers outside. She had a gorgeous rose bush with orange blooms. After chatting with them for a while, we participated in making bread. 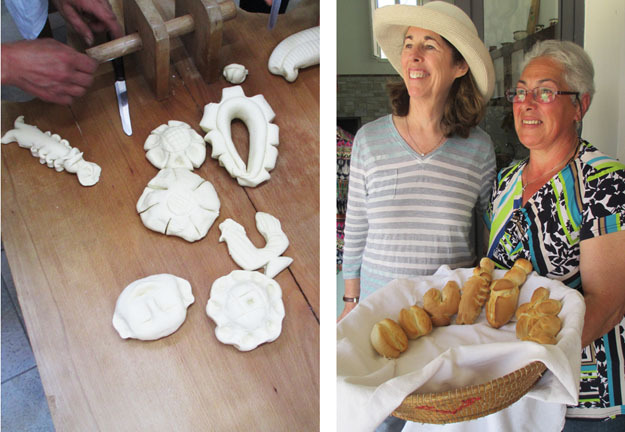 Concetta makes 15 loaves of bread a week, baking them in a wood burning oven. She uses a sour dough starter for her bread and has a contraption to knead the bread that two people operate. One person moves the bread around and the other person pumps the bar that kneads it. 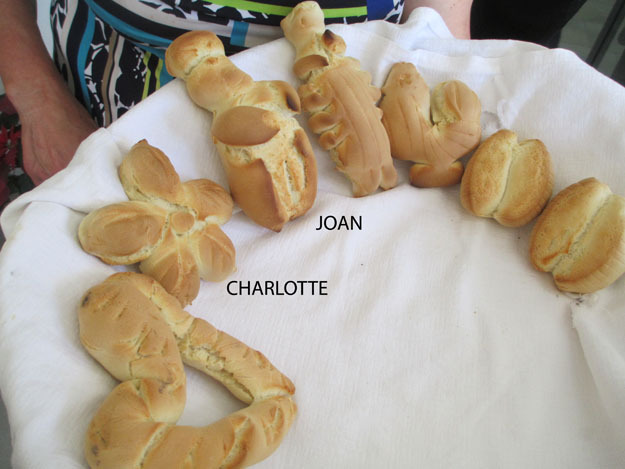 We then formed small decorative loaves that she baked for us. Here are our creations in bread. Charlotte made a flower and I made a doughboy! 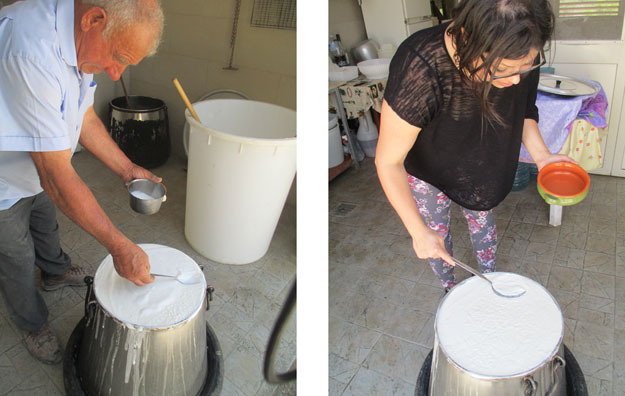 Turi showed us how he and his son make cheese and we helped squeeze the water out of the fresh cheese. 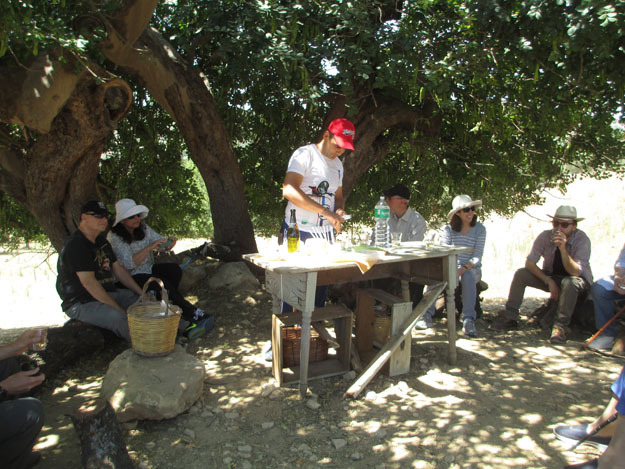 Then we took a break from the farm work and settled under a carob tree to sample the Turi’s cheeses and sip wine. Then it was time for lunch. The first course was fresh ricotta cheese that was served in bowls and had the consistency of a loose pudding. It was eaten with bread, olives, sausage, and hard cheese. The second course was marinated grilled chicken, grilled veal, peas and carrots, and pizza. This was followed by fresh fruit. 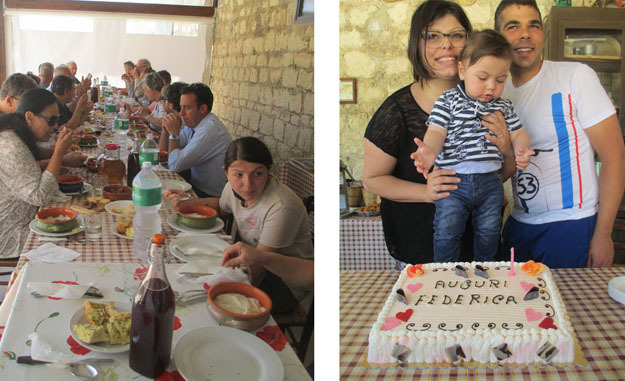 Because it was their daughter-in-law’s birthday, her family joined us for lunch. The last course was a birthday cake consisting of several layers with different fillings and whipped cream icing. 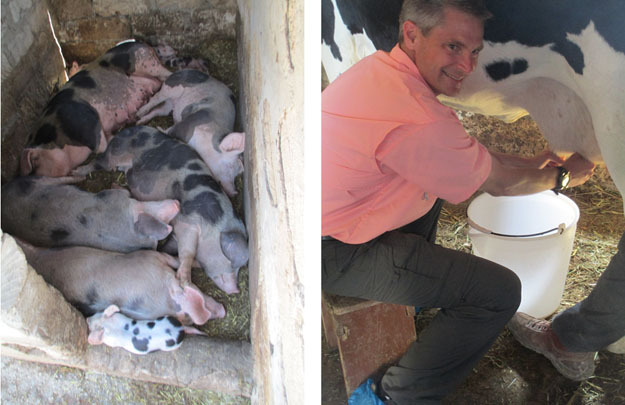 After lunch we checked out the pigs and piglets who were having a siesta. Then we took turns milking one of the cows. The whole experience was delightful as we got to know the family and were welcomed into their home. This entry was posted in Sicily 2016 on May 20, 2016 by JWH. 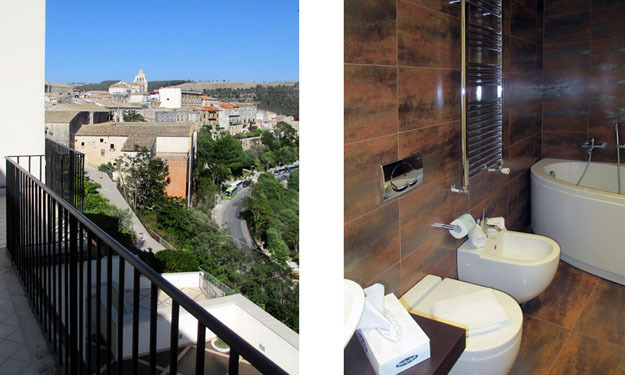 Ragusa is a charming city built on a limestone rock. An earlier city was devastated by an earthquake in the 17th century so the current buildings were rebuilt in the Baroque style. There are two parts to the city, the old part where we our hotel is located and the new part where the city is expanding. 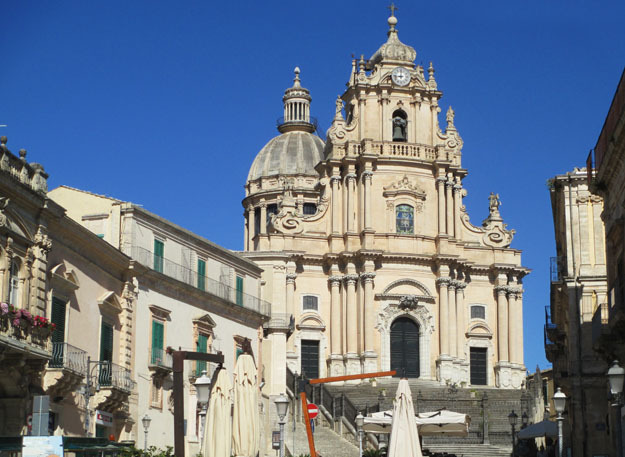 Oil was discovered here in recent years which makes the city the most economically prosperous of all the cities in Sicily. Our tour director attended the university of foreign languages here and now lives here with his fiance, whom he met here. He loves the city so we had historical, cultural, and Giuseppe’s personal walking tours where we visited historical sites as well as the grocery store where he shopped as a student, where he took his finance for their first date, etc. 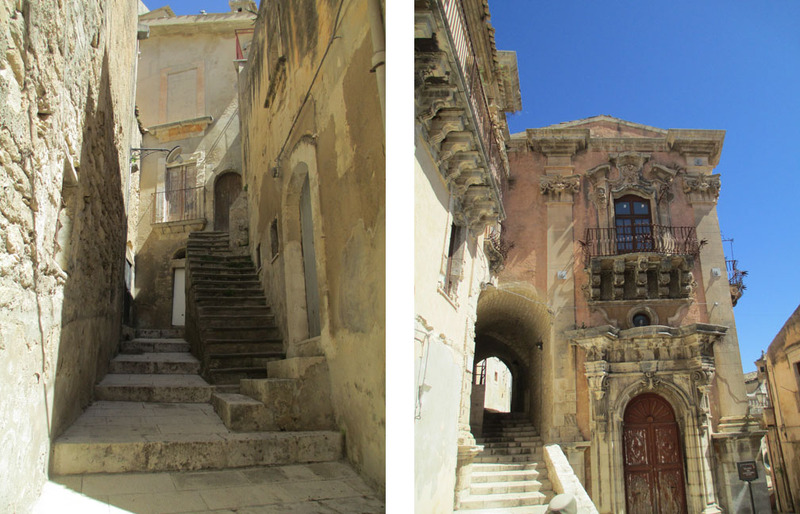 The extremely popular Italian TV series, Inspector Montalbono, was been filmed in Ragusa, so Giuseppe pointed out where many of the scenes took place. This is the view of the old city from the taller rock hill where the new city was built. The old city has narrow streets, as usual, but also lots of steps. 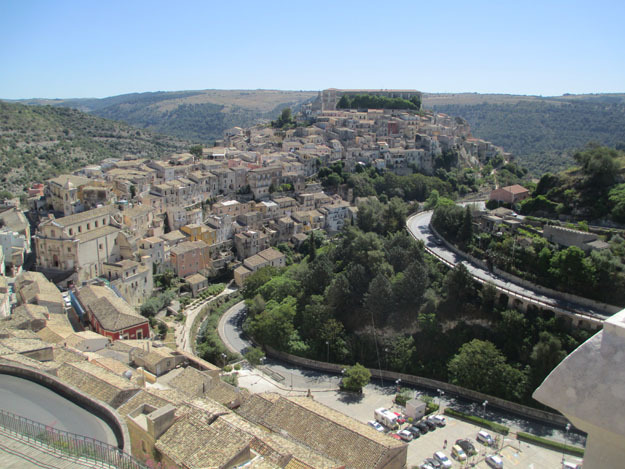 Would you believe that I have friends who visited Ragusa 7 years ago and got lost and decided the only way out of town was to drive down some steps! The plaza in front of the main church is a popular place to hang out. Scenes from Inspector Montalbano have been filmed in the area. 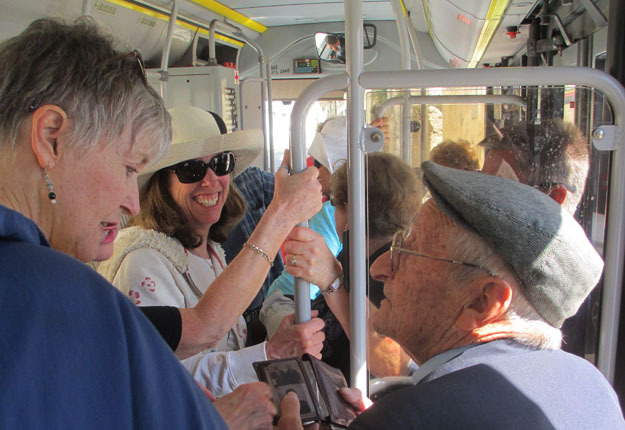 We took a local bus to the new city and were encouraged to interact with the locals. Charlotte made friends with a 93 old widower who is showing her pictures of his family. 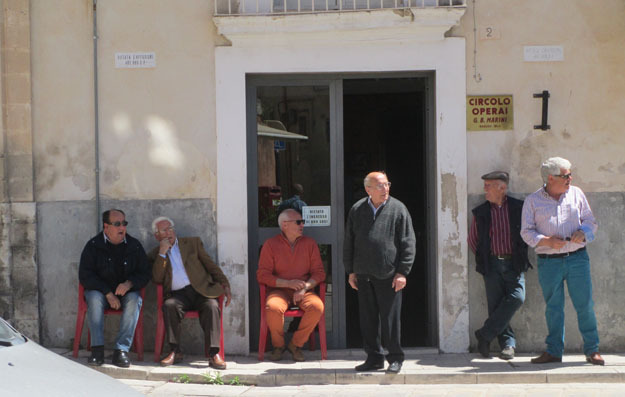 In towns throughout Sicily we see lots of old men hanging out together and discovered that they set up self supporting senior centers for themselves and charge an annual dues to cover expenses. They play cards, read newspapers, and solve the problems of the world there. Women are permitted to join, but few do. We were invited into this one and we chatted with the pensioners. 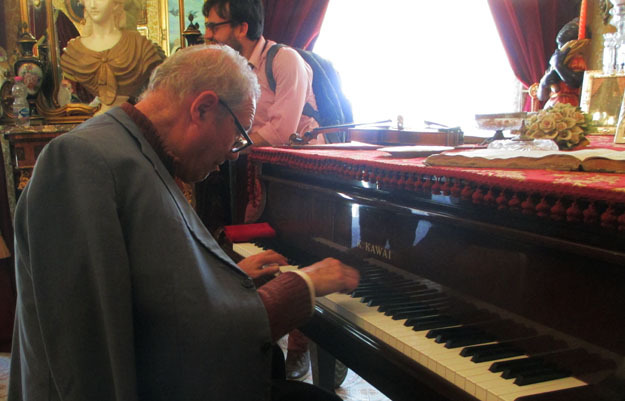 Giuseppe took us to meet his friend, Maestro Piano, who ironically is an accomplished pianist who once accompanied Maria Callas in her practice sessions. The Maestro comes from an old aristocratic family and has inherited a vast collection of art and antiques and has gone to great efforts to preserve and restore them. 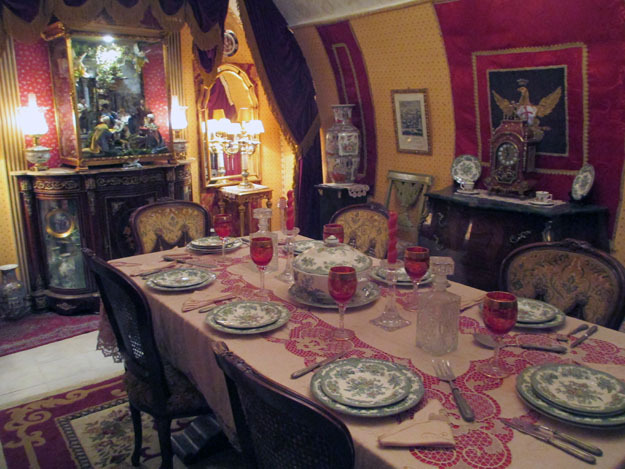 The Maestro played for us and then gave us a tour of several rooms of his home to see his family treasures. In the evening we went to the nearby city of Modica for dinner. 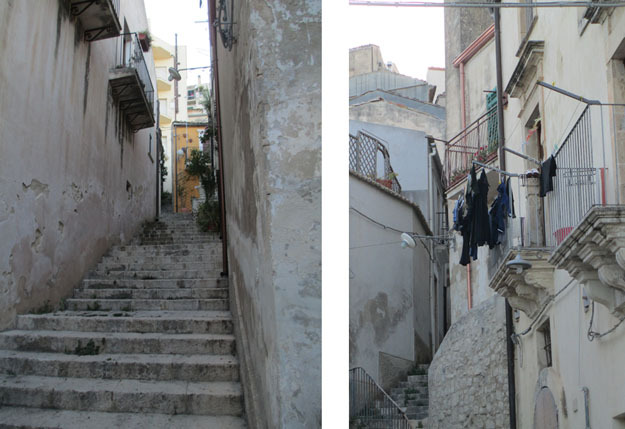 But before dinner we explored the town, which like Ragusa, it is built on a hill of rock and has very narrow streets. 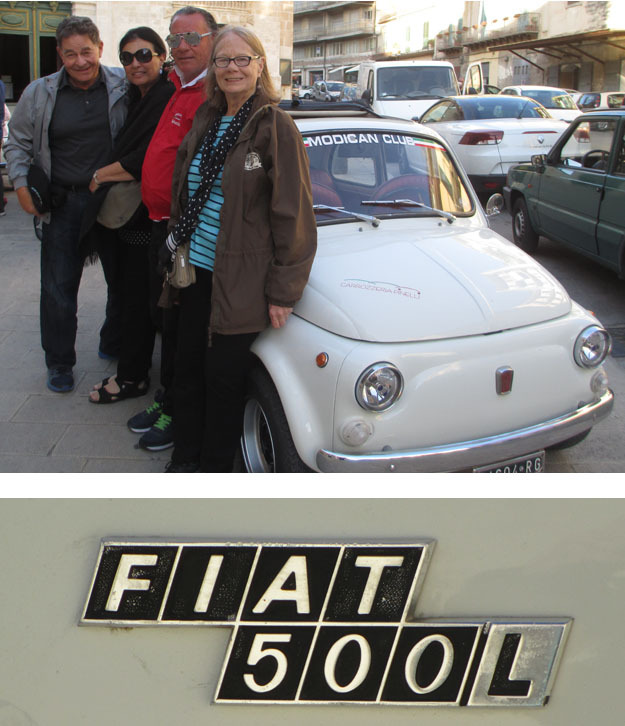 We traveled by vintage Fiats. Here are the cars. They are VERY small! Three Americans squeezed into a car with a race car driver and off we took, up and down and around the narrow streets like bats out of hell. It was better than an amusement park ride! When locals heard us coming they jumped out of the way. Here is a video of the hair raising experience. The only sound lacking in the video are our screams. Here is our fearless driver, Salvedore, and my companion joy riders/surviors, John and Sandy. 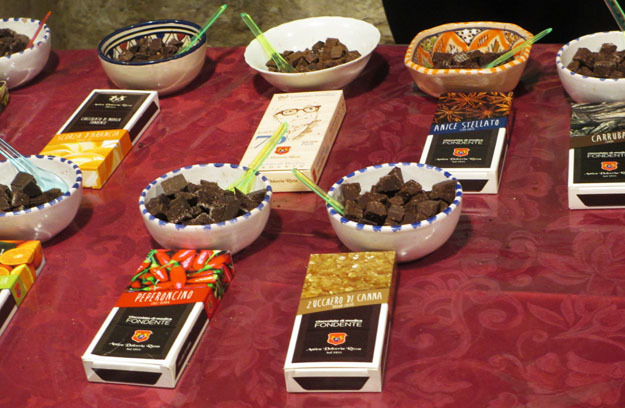 Modica is known for its chocolate. They make it with cocoa and sugar, but no cocoa butter. Therefore, it does not melt which is perfect for Sicily since temperatures in the summer are very hot. The chocolate comes in many flavors, so we had a chocolate tasting! What a day! Mama mia! 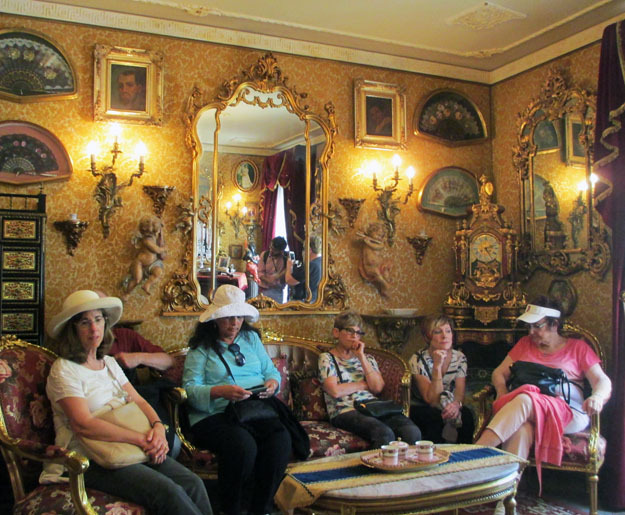 This entry was posted in Sicily 2016 on May 18, 2016 by JWH. Yesterday morning we headed to Villa Romana del Casale, a 4th century AD villa with the best and most extensive collection of Roman mosaics in their original location in the world. The luxurious residence was probably used by the Roman official who administered this region of Sicily. 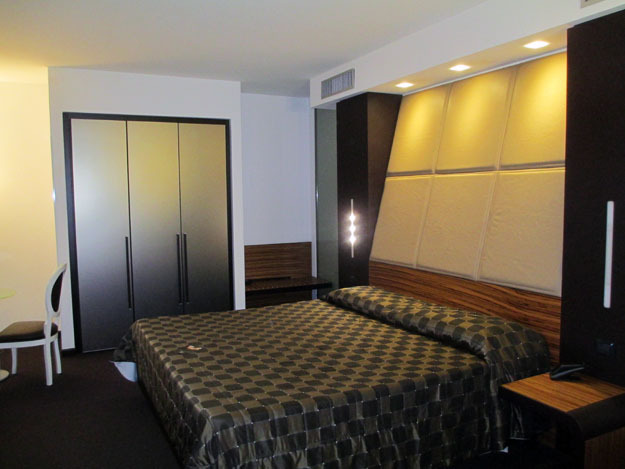 There are many guest rooms arranged around a courtyard and then private quarters for the owner’s family. 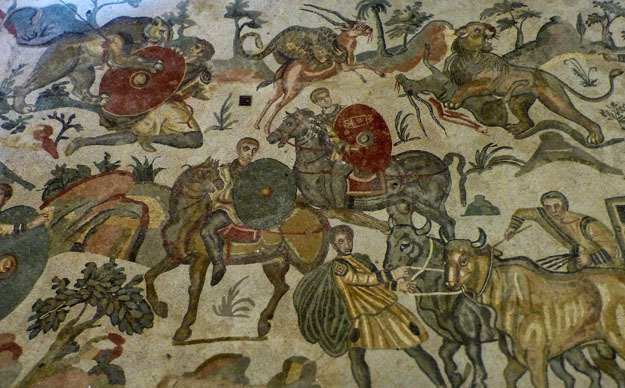 It was mostly likely used as a hunting lodge since many of the mosaic images depict exotic animals and hunt scenes. There is a section with thermal baths of different temperatures, massage/sauna, and workout room. Also, there is a large room which would have been used for administrative purposes such as where contracts were negotiated, courts were held, and taxes collected. 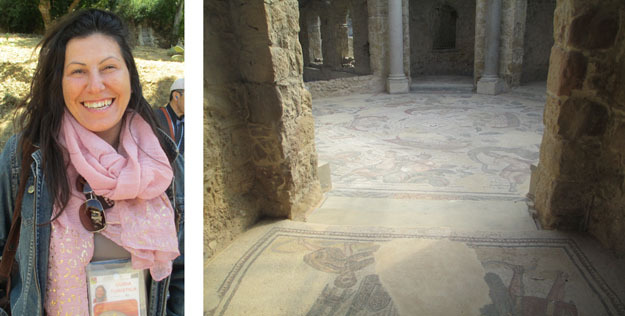 In the 12th century the area was covered by a landslide that damaged much of the villa but protected the mosaic flooring. 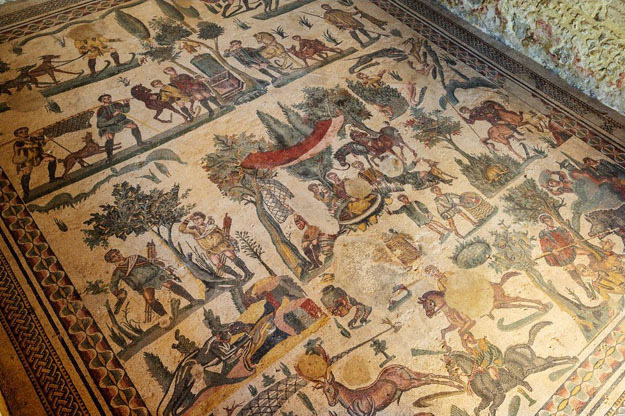 Extensive restoration has taken place so that now visitors can get a sense of the size and scale of the villa and view the floors with the fabulous mosaic images. The mosaics are made of small pieces of colored marble gathered from throughout the Mediterranean and north African world. The extensiveness of the mosaics, the elaborateness of the images, and complexities of the designs are mind blowing! 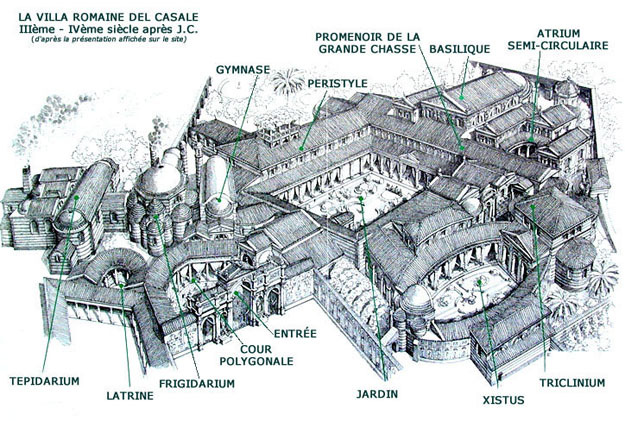 Here is a diagram of the villa. On the left is Katia, our local guide who shared a wealth of information about the site and on the left is part of the gymnasium. At one time the walls were frescoed, so along with the elaborately decorated flooring, the villa would have been quite a splendid place. Every room and corridor has a mosaic floor and we were able to view them from above from platforms. It was difficult to get good images of the floors, so some of my pictures come from the internet. In one area there were images of a variety of different animals within medalions like the bear on the left. One of the most famous scenes is from the room of love on the right. There is a wide 200 foot long corridor that depicts hunting scenes. 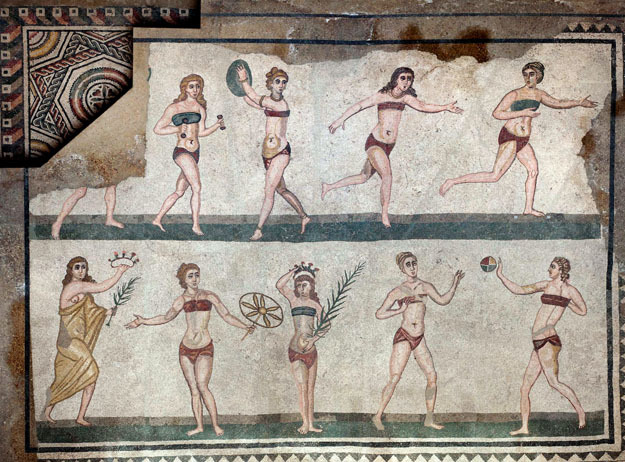 This is a famous floor image depicting women athletes competing in different events and receiving prizes. The landscape here is spectacular! Unfortunately I cannot take good pictures from the moving bus, so what I am about to post are far from the real thing! 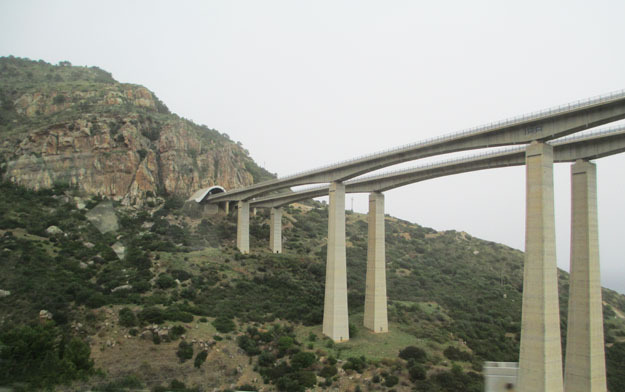 In the area around Palermo, the terrain is mountainous and many of the roads go through tunnels. It also was noticeably greener in the northwest of the island. 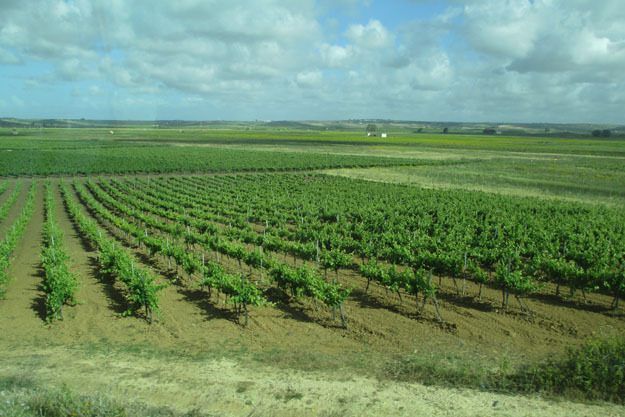 In the southwest it is flat with miles and miles of olive groves and vineyards. 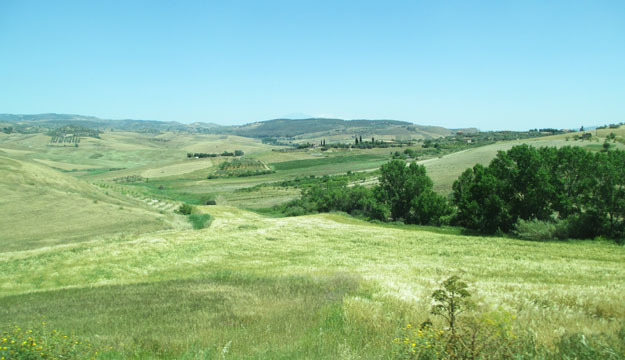 In the south-central area, there are rolling hills and it is very agricultural. In addition to olives and grapes, we’ve seen fields of artichokes, prickly pears, and lots of wheat fields. The color of the fields tend to be more golden. Around Ragusa, there are rivers that have cut through the limestone making deep valleys and the soil is very rocky. Everywhere there are vineyards and olive trees. From the higher elevations, the panoramic views are wonderful! The scene is broken up like a patchwork quilt of fields with various patterns and all beautiful tended. Here is a 3 minute video that I hope captures the beauty of the area better than any of my photos. Since our group is small (15 travelers) the tour company can book us into small hotels with lots of local character rather than large international, all look-alike mega hotels. So late yesterday we checked into our hotel in the old part of Ragusa and discovered it was in a very old building, but just recently remodeled. Because I am a frequent traveler with the tour company, once again I was upgraded. And I was a bit flabbergasted when I entered my room/s! I have a suite with a huge bedroom and king-size bed, a spacious outdoor patio with a fantastic view, and two full bathrooms – one with a shower and one with a soaking tub. The city is built on a big rock. From the back of the hotel, you enter on the ground floor (red dot,) but from the front you enter on the 5th floor. My room is on the 5th floor and the arrow points to my patio. My room was at one time the home of one of the men who founded the Christian Democratic Party in Italy in 1919. He opposed Fascism and was exiled in 1924 and did not return until 1946. Bathroom #2 and view from my patio. 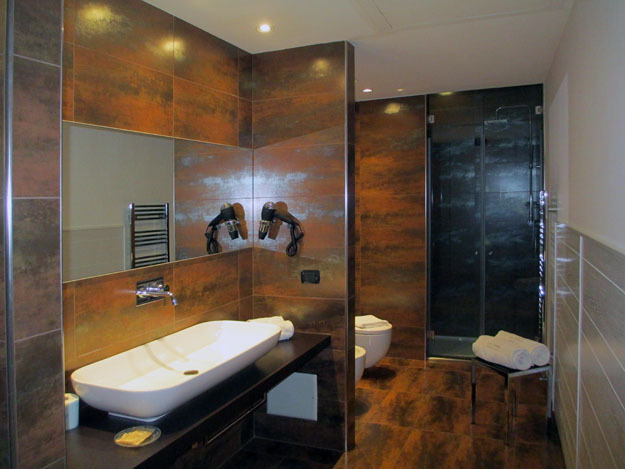 What a dilemma – should I take a shower in bathroom #1 or a soaking bath in bathroom #2?